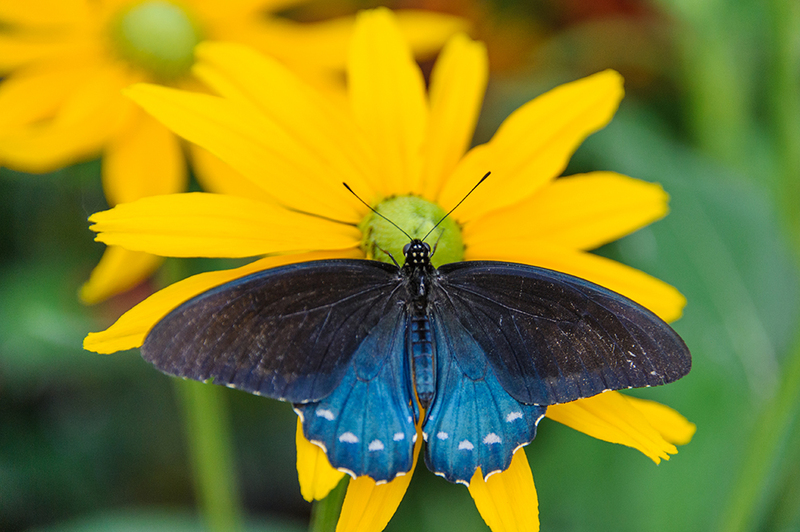 The pipevine swallowtail (Battus philenor) is our featured butterfly this week. This beauty can be found in the southern half of the United States all the way south to Mexico. Occasionally it can even be found further north. In Mexico, pipevines can be found all year round. Like many butterflies, the pipevine swallowtail warns potential predators with its bright colors that it is inedible. Caterpillars feed on the toxic leaves of Aristolochia species and become unpalatable, staying that way through their metamorphosis. Females even pass the toxins along to eggs, which then also become protected. Another beautiful native, the spicebush swallowtail (Papilio troilus) mimics the pipevine swallowtail as a form of defense—the pipevine’s bad taste and toxic makeup are enviable traits in a butterfly! Though not toxic itself, the spicebush’s convincing disguise fools predators into thinking twice before snacking. 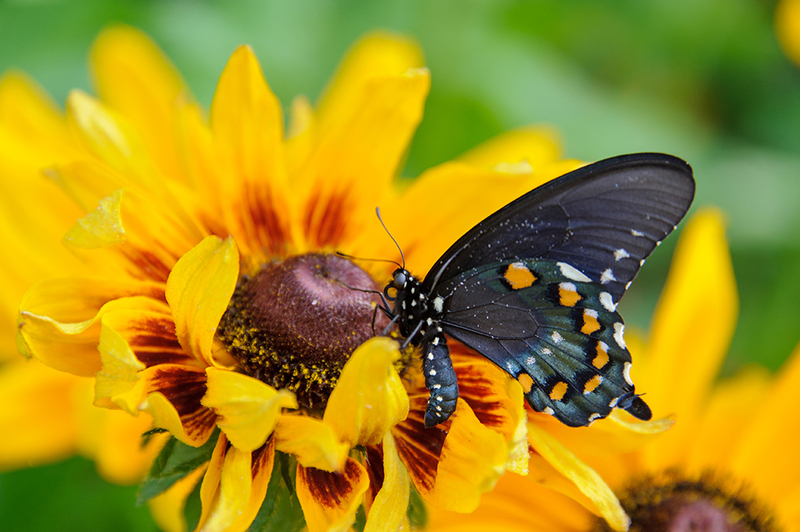 Like many other butterflies, the pipevine swallowtail gets its nutrients from “puddling,” in which a group of butterflies gathers at one location, such as a shallow puddle or a mud pile, and drinks any available liquid. This is a common way to supplement their primary diet of nectar with much needed salts and minerals. This beautiful butterfly regularly visits our coneflower (Echinacea purpurea) in the Butterflies & Blooms exhibition, and can easily be spotted. Make sure to check them out on your next trip to the Garden!